(Following a tour of France, His Imperial Highness Prince Louis-Napoleon Bonaparte, President of the French Republic since 1848, makes the following speech at Bordeaux in the South-West. The reactions of the people along the route leave no one in doubt. 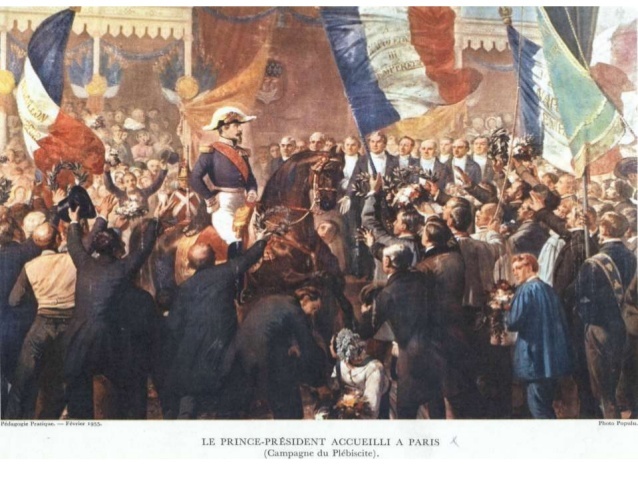 The Prince-President will be Napoleon III, Emperor of the French, by December 1852). The invitation of the chamber and of the tribunal of commerce of Bordeaux, which I accepted with enthusiasm, provides me with the opportunity to thank your great city for its most cordial welcome and its magnificent hospitality, and I am also offered the possibility toward the end of my journey, to share with you the impressions with which I am left. The aim of this journey, as you know, was to know for myself our beautiful regions of the South, and to reply profoundly to their needs. It has, however, produced an even more important result. In effect, I can say frankly without pride or false modesty, no people has ever shown more explicitly, more spontaneously, their will to free themselves from fear of the future, by consolidating in the same hand a power that is benevolent toward them. It is because they know today, both the treacherous hopes with which others tried to lull them to sleep, and the dangers that menaced them. The people know that in 1852 society was heading for disaster, because each party consoled itself of the approaching shipwreck with the hope of planting its flag on the debris that might remain afloat. They are grateful to me for saving the ship entire, by flying only the banner of all France. Disappointed by absurd theories, the people have become convinced that the so-called reformers were no more than dreamers, for there was always a lack of realisation, disproportion between their means and the promised results. Today, France surrounds me with her affection, because I am not of the family of ideologists. To do good for our country, there is no need to apply new systems, but to give above all, confidence in the present, security in the future. This is why France seems to wish for the return of the Empire. There is nonetheless a fear to which I have a duty to reply. Out of a desire to provoke, some say: the Empire is war. I say: the Empire is peace. I agree however that I, like the Emperor, have many conquests to make. I want, like him, to conquer by reconciling them, the parties now fighting amongst themselves and to bring into the currents of the great river of the people the hostile deviations that head towards their destruction with no profit to anyone. I want to conquer for religion, morality, and prosperity, the still great numbers of the population which, in the midst of a country of faith and belief, know almost nothing of the teachings of Christ, and which in the most fertile land in the world receive almost no benefits from the fruits of their labour. We have immense fallow areas to turn into growing land, roads to open, ports to dig, rivers to make navigable, canals to finish, our railway network to complete. 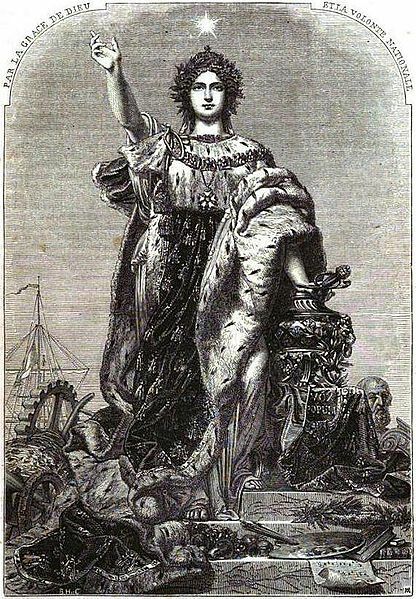 We have, opposite Marseille, a vast kingdom to assimilate to France. We have all our great ports to the West to bring closer to the American continent by the rapidity of the communications that we still lack. In conclusion, we have everywhere ruins to rebuild, false gods to strike down, truths to cause to triumph. This is what I would understand by empire, if the Empire should be re-established. Such are the conquests I dream of, and all of you who surround me, who want as I do the happiness of our homeland, you are my soldiers! Cet article, publié dans Agriculture, cultes, Europe, idées napoléoniennes, IN MEMORIAM, industrie, institutions, Intérieur, Références - Sources, Santé et Affaires sociales, Travaux publics, Urbanisme, Urbanisme, travaux publics, patrimoine et culture, est tagué 12, 9, America, belief, Bonaparte, Bonapartism, Bonapartiste, canals, chamber, Christ, collision, commerce, communications, confidence in the present, conqueror, conquests, continent, country, crops, débris, democracy, destruction, dreamers, Emperor, Empire, Europe, faith, fallow, fear, felicity, flag, France, glory, governance, grace of god, growing, happiness, Humanity, imperial highness, inheritance, land, Le Moniteur universel, Louis XIV, Louis-Napoléon, Marseille, middle of the road government, morality, Napoléon III, Napoleon, Napoleon I, Napoleon the First, napoleon the great, Napoleon the Third, national will, necessity, October, parties, peace, pleasure, Prince President, prosperity, railways, réconciliation, reconciling, reformers, religion, reply, Republic, rivers, security in the future, shipwreck, soldiers, teachings, the Empire is peace, the man of the middle way, third way, tribunal, vox populi, war, world. Ajoutez ce permalien à vos favoris.